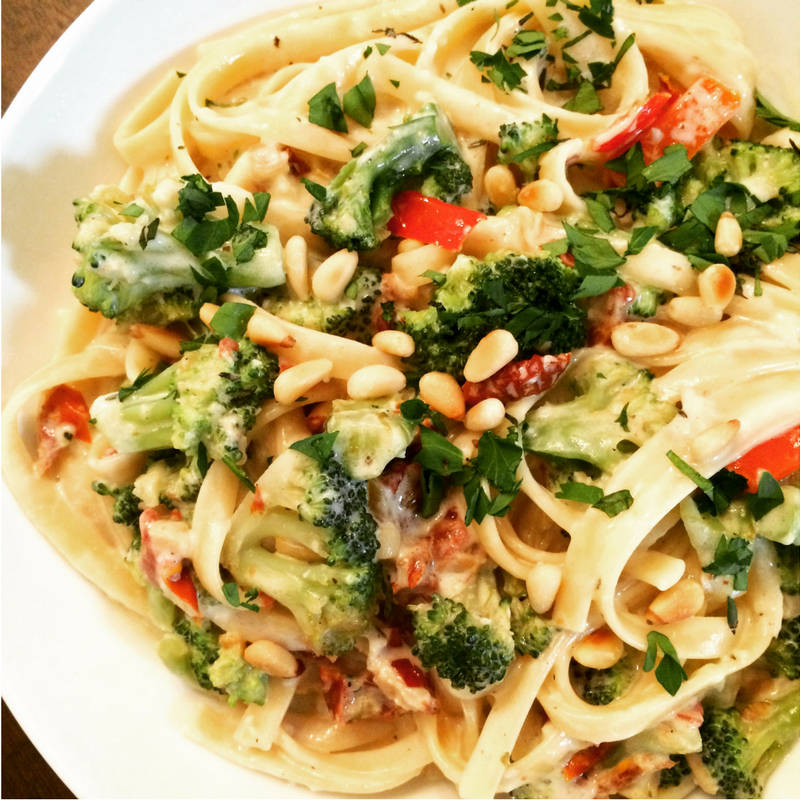 The latest addition to our Pasta Night rotation is this creamy Alfredo deliciousness packed with colorful, good-for-you veggies. This recipe is easily customizable to whatever vegetables and pasta you have on hand. Bring a large pot of water to a boil. Add broccoli and cook until crisp-tender, around 5 minutes. Remove from heat, drain, and rinse with cold water. Set aside. Place pine nuts in a large, dry skillet over medium heat. Toast pine nuts 2-3 minutes, until light golden brown and slightly fragrant. Shake the span frequently to avoid burning the pine nuts. Remove from pan and set aside. Pour 1 Tablespoon olive oil in the skillet. Add red peppers and onions. Cook, stirring frequently, 3-5 minutes. Add 2 cloves minced garlic and continue cooking another 1-2 minutes. Stir in broccoli and sun-dried tomatoes. Set mixture aside and keep warm. To the pot used to cook the broccoli, add butter and olive oil over medium heat. Add remaining 2 cloves of garlic, cooking 1-2 minutes. Add heavy cream and black pepper. Bring to a boil then reduce heat to low and allow to simmer, stirring frequently, 5-7 minutes. Stir in Parmesan and mozzarella cheeses a little bit at a time, allowing each addition to melt prior to adding more, until all cheese is incorporated into the sauce. Adjust seasoning to taste. Toss Alfredo sauce with cooked pasta. 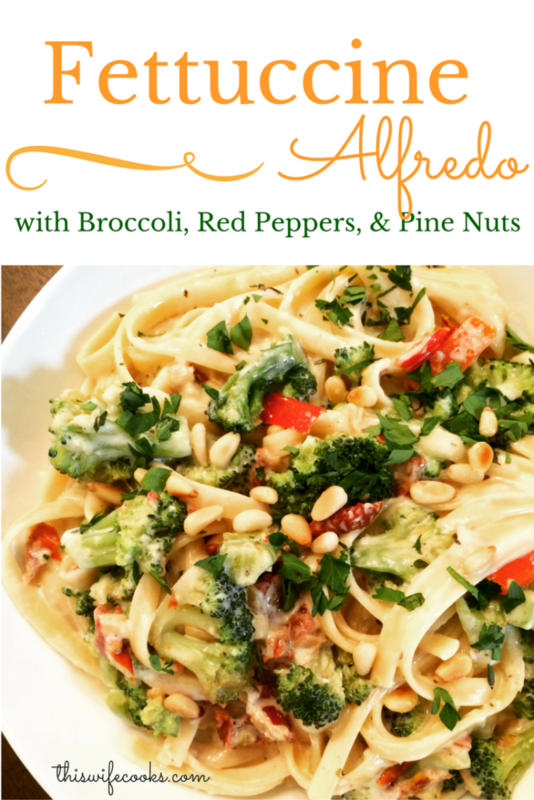 Stir in the broccoli/red pepper/onion mixture, top with toasted pine nuts, parsley, and thyme. Serve warm.